The Polk RM6751 satellite speaker accommodates listeners who want to add a channel or two to their existing 5.1-channel surround sound speaker system. Specifically designed for Polk's RM6750 setup--which itself comes with four satellites, a center speaker, and a subwoofer--the satellite helps fill out the rear effects, creating a true top-of-the-line home theater compatible with the latest surround encoding formats. Each RM6751 speaker is equipped with a 3.25-inch polymer composite cone midrange driver that's lightweight and efficient, along with a high-performance 0.5-inch silk dome tweeter. Combined, the drivers create a clear, distortion-free midrange and smooth highs. 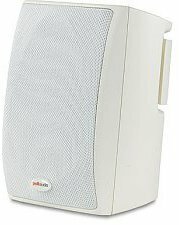 The speaker also employs the same PowerPort bass vent technology used in Polk's line of full-sized speakers, thus improving the lower midrange response. The result is a midrange with no "hole" between the satellite and the sub frequencies, helping male vocals sound rich and full rather than thin and weak (as with most other sub/sat systems). Meanwhile, the satellite's integrated baffle and grille design allows for maximum sound dispersion and minimum diffraction, letting everyone in the room hear the same clear, well-balanced audio. The speaker is housed within a mineral-filled, non-resonant, white-finished polypropylene enclosure that not only sounds natural, but also looks great. To top it off, the speaker includes an integrated keyhole slot-mounting bracket for effortless wall mounting. And because the speaker is magnetically shielded, you can locate the speaker near the TV without suffering from video interference. The speaker measures 4.06 by 6.5 by 5 inches (W x H x D) and is backed by a five-year warranty. RM6751 satellite speaker, mounting bracket, user's manual.